Adolf Hitler is appointed Chancellor of Germany, a nation with a Jewish population of 566,000. 40,000 SA and SS men are sworn in as auxiliary police. Nazis burn Reichstag building to create crisis atmosphere. Emergency powers granted to Hitler as a result of the Reichstag fire. Nazis open Dachau concentration camp near Munich, to be followed by Buchenwald near Weimar in central Germany, Sachsenhausen near Berlin in northern Germany, and Ravensbrück for women. German Parliament passes Enabling Act giving Hitler dictatorial powers. Nazis stage boycott of Jewish shops and businesses. The Gestapo is born, created by Hermann Göring in the German state of Prussia. Burning of books in Berlin and throughout Germany. Nazi Party is declared the only legal party in Germany. Also, Nazis pass law to strip Jewish immigrants from Poland of their German citizenship. Nazis pass law allowing for forced sterilization of those found by a Hereditary Health Court to have genetic defects. Nazis establish Reich Chamber of Culture, then exclude Jews from the arts. Nazis prohibit Jews from owning land. Jews are prohibited from being newspaper editors. Nazis pass a Law against Habitual and Dangerous Criminals, which allows beggars, the homeless, alcoholics and the unemployed to be sent to concentration camps. The “night of long knives” occurs as Hitler, Göring and Himmler conduct a purge of the S.A. (storm trooper) leadership. The S.S. (Schutzstaffel) is made an independent organization from the SA. Jews are prohibited from getting legal qualifications. German President von Hindenburg dies. Hitler becomes Führer. Hitler receives a 90 percent ‘Yes’ vote from German voters approving his new powers. Nazis ban Jews from serving in the military. Nazis pass law allowing forced abortions on women to prevent them from passing on hereditary diseases. Nazis force Jewish performers/artists to join Jewish Cultural Unions. Nuremberg Race Laws against Jews decreed. The German Gestapo is placed above the law. S.S. Deathshead division is established to guard concentration camps. Heinrich Himmler is appointed chief of the German Police. Olympic games begin in Berlin. Hitler and top Nazis seek to gain legitimacy through favorable public opinion from foreign visitors and thus temporarily refrain from actions against Jews. Nazis set up an Office for Combating Homosexuality and Abortions (by healthy women). Jews are banned from many professional occupations including teaching Germans, and from being accountants or dentists. They are also denied tax reductions and child allowances. “Eternal Jew” travelling exhibition opens in Munich. Nazis prohibit Aryan “front-ownership” of Jewish businesses. Nazis order Jews to register wealth and property. Nazis order Jewish-owned businesses to register. At Evian, France, the U.S. convenes a League of Nations conference with delegates from 32 countries to consider helping Jews fleeing Hitler, but results in inaction as no country will accept them. Nazis prohibited Jews from trading and providing a variety of specified commercial services. Nazis order Jews over age 15 to apply for identity cards from the police, to be shown on demand to any police officer. Jewish doctors prohibited by law from practicing medicine. Nazis require Jewish women to add Sarah and men to add Israel to their names on all legal documents including passports. Jews are prohibited from all legal practices. Nazi troops occupy the Sudetenland. Nazis arrest 17,000 Jews of Polish nationality living in Germany, then expel them back to Poland which refuses them entry, leaving them in “no-man’s land” near the Polish border for several months. Ernst von Rath, third secretary in the German Embassy in Paris, is shot and mortally wounded by Herschel Grynszpan, the 17-year old son of one of the deported Polish Jews. Rath dies on November 9, precipitating Krystallnacht. Nazis fine Jews one billion marks for damages related to Kristallnacht. Jewish pupils are expelled from all non-Jewish German schools. Law for compulsory Aryanization of all Jewish businesses. S.S. leader Reinhard Heydrich is ordered by Göring to speed up emigration of Jews. Hitler threatens Jews during Reichstag speech. Nazis force Jews to hand over all gold and silver items. 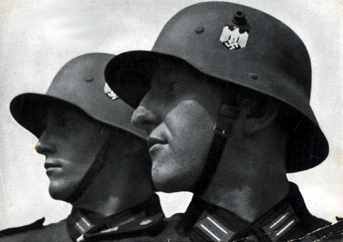 Nazi troops seize Czechoslovakia (Jewish population: 350,000). Slovakia passes its own version of the Nuremberg Laws. Jews lose rights as tenants and are relocated into Jewish houses. The St. Louis, a ship crowded with 930 Jewish refugees, is turned away by Cuba, the United States and other countries and returns to Europe. German Jews denied the right to hold government jobs. Adolf Eichmann is appointed director of the Prague Office of Jewish Emigration. Nazis invade Poland (Jewish population: 3.35 million, the largest in Europe). Beginning of SS activity in Poland. Jews in Germany are forbidden to be outdoors after 8 P.M. in Winter and 9 P.M. in Summer. England and France declare war on Germany. Warsaw is cut off by the German Army. Soviet troops invade eastern Poland. Heydrich issues instructions to SS Einsatzgruppen (special action squads) in Poland regarding treatment of Jews, stating they are to be gathered into ghettos near railroads for the future “final goal.” He also orders a census and the establishment of Jewish administrative councils within the ghettos to implement Nazi policies and decrees. German Jews are forbidden to own wireless (radio) sets. Warsaw surrenders; Heydrich becomes leader of RSHA. controlled areas, leaving 1.3 million in the Soviet area. Nazis begin euthanasia on sick and disabled in Germany. Proclamation by Hitler on the isolation of Jews. Evacuation of Jews from Vienna. Hans Frank appointed Nazi Gauleiter (governor) of Poland. Forced labor decree issued for Polish Jews aged 14 to 60. Adolf Eichmann takes over section IV B4 of the Gestapo dealing solely with Jewish affairs and evacuations. Nazis choose the town of Oswiecim (Auschwitz) in Poland near Krakow as site of new concentration camp. Nazis invade Denmark (Jewish population: 8,000) and Norway (Jewish population: 2,000). The Lodz Ghetto in occupied Poland is sealed off from the outside world with 230,000 Jews locked inside. Rudolf Höss is chosen to be kommandant of Auschwitz. Nazis invade France (Jewish pop. 350,000), Belgium (Jewish pop. 65,000), Holland (Jewish pop. 140,000), and Luxembourg (Jewish pop. 3,500). Paris is occupied by the Nazis. France signs an armistice with Hitler. Eichmann’s Madagascar Plan presented, proposing to deport all European Jews to the island of Madagascar, off the coast of east Africa. The first anti-Jewish measures are taken in Vichy France. Romania introduces anti-Jewish measures restricting education and employment, then later begins “Romanianization” of Jewish businesses. Tripartite (Axis) Pact signed by Germany, Italy and Japan. Vichy France passes its own version of the Nuremberg Laws. Nazis invade Romania (Jewish population: 34,000). Deportation of 29,000 German Jews from Baden, the Saar, and Alsace-Lorraine into Vichy France. Hungary, Romania, and Slovakia become Nazi Allies. The Krakow Ghetto is sealed off containing 70,000 Jews. The Warsaw Ghetto, containing over 400,000 Jews, is sealed off. A pogrom in Romania results in over 2,000 Jews killed. Hitler’s Commissar Order authorizes execution of anyone suspected of being a Communist official in territories about to be seized from the Soviets. Nazis occupy Bulgaria (Jewish population: 50,000). German Jews ordered into forced labor. A “Commissariat” for Jewish Affairs is set up in Vichy France. Nazis invade Yugoslavia (Jewish population: 75,000) and Greece (Jewish population: 77,000). French Marshal Petain issues a radio broadcast approving collaboration with Hitler. Nazis invade the Soviet Union (Jewish population: 3 million). 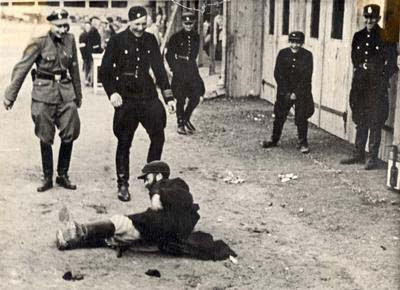 Romanian troops conduct a pogrom against Jews in the town of Jassy, killing 10,000. As the German Army advances, S.S. Einsatzgruppen follow along and conduct mass murder of Jews in seized lands. Ghettos established at Kovno, Minsk, Vitebsk and Zhitomer. Also in July, the government of Vichy France seizes Jewish owned property. Nazi racial “philosopher” Alfred Rosenberg is appointed Reich Minister for the Eastern Occupied Territories to administer territories seized from the Soviet Union. In occupied Poland near Lublin, Majdanek concentration camp becomes operational. 3,800 Jews killed during a pogrom by Lithuanians in Kovno. Göring instructs Heydrich to prepare for Final Solution. Jews in Romania forced into Transnistria. By December, 70,000 perish. Ghettos established at Bialystok and Lvov. The first test use of Zyklon-B gas at Auschwitz. German Jews ordered to wear yellow stars. The Vilna Ghetto is established containing 40,000 Jews. Beginning of general deportation of German Jews. S.S. Einsatzgruppen murder 33,771 Jews at Babi Yar near Kiev. 35,000 Jews from Odessa shot. Beginning of the German Army drive on Moscow. Nazis forbid emigration of Jews from the Reich. S.S. Einsatzgruppe B reports a tally of 45,476 Jews killed. Theresienstadt Ghetto is established near Prague, Czechoslovakia. The Nazis will use it as a model ghetto for propaganda purposes. Near Riga, a mass shooting of Latvian and German Jews. Japanese attack United States at Pearl Harbor. The next day the U.S. and Britain declare war on Japan. In occupied Poland, near Lodz, Chelmno extermination camp becomes operational. Jews taken there are placed in mobile gas vans and driven to a burial place while carbon monoxide from the engine exhaust is fed into the sealed rear compartment, killing them. The first gassing victims include 5,000 Gypsies who had been deported from the Reich to Lodz. Hitler declares war on the United States. Roosevelt then declares war on Germany saying, “Never before has there been a greater challenge to life, liberty and civilization.” The U.S.A. then enters the war in Europe and will concentrate nearly 90 percent of its military resources to defeat Hitler. Mass killings of Jews using Zyklon-B begin at Auschwitz-Birkenau in Bunker I (the red farmhouse) in Birkenau with the bodies being buried in mass graves in a nearby meadow. S.S. Einsatzgruppe A reports a tally of 229,052 Jews killed. In occupied Poland, Belzec extermination camp becomes operational. The camp is fitted with permanent gas chambers using carbon monoxide piped in from engines placed outside the chamber, but will later substitute Zyklon-B. The deportation of Jews from Lublin to Belzec. The start of deportation of Slovak Jews to Auschwitz. The start of deportation of French Jews to Auschwitz. Fritz Sauckel named Chief of Manpower to expedite recruitment of slave labor. First trainloads of Jews from Paris arrive at Auschwitz. First transports of Jews arrive at Majdanek. In occupied Poland, Sobibor extermination camp becomes operational. The camp is fitted with three gas chambers using carbon monoxide piped in from engines, but will later substitute Zyklon-B. The New York Times reports on an inside page that Nazis have machine-gunned over 100,000 Jews in the Baltic states, 100,000 in Poland and twice as many in western Russia. S.S. leader Heydrich is mortally wounded by Czech underground agents. Gas vans used in Riga. Jews in France, Holland, Belgium, Croatia, Slovakia, Romania ordered to wear yellow stars. S.S. report 97,000 persons have been “processed” in mobile gas vans. Nazis liquidate Lidice in retaliation for Heydrich’s death. Eichmann meets with representatives from France, Belgium and Holland to coordinate deportation plans for Jews. At Auschwitz, a second gas chamber, Bunker II (the white farmhouse), is made operational at Birkenau due to the number of Jews arriving. The New York Times reports via the London Daily Telegraph that over one million Jews have already been killed by Nazis. Swiss representatives of the World Jewish Congress receive information from a German industrialist regarding the Nazi plan to exterminate the Jews. They then pass the information on to London and Washington. Jews from Berlin sent to Theresienstadt. 12,887 Jews of Paris are rounded up and sent to Drancy Internment Camp located outside the city. A total of approximately 74,000 Jews, including 11,000 children, will eventually be transported from Drancy to Auschwitz, Majdanek and Sobibor. Himmler visits Auschwitz-Birkenau for two days, inspecting all ongoing construction and expansion, then observes the extermination process from start to finish as two trainloads of Jews arrive from Holland. Kommandant Höss is then promoted. Construction includes four large gas chamber/crematories. Himmler orders Operation Reinhard, mass deportations of Jews in Poland to extermination camps. Beginning of deportations from the Warsaw Ghetto to the new extermination camp, Treblinka. Also, beginning of the deportation of Belgian Jews to Auschwitz. Treblinka extermination camp opened in occupied Poland, east of Warsaw. The camp is fitted with two buildings containing 10 gas chambers, each holding 200 persons. Carbon monoxide gas is piped in from engines placed outside the chamber, but Zyklon-B will later be substituted. Bodies are burned in open pits. The start of deportations of Croatian Jews to Auschwitz. Beginning of German Army attack on Stalingrad. Open pit burning of bodies begins at Auschwitz in place of burial. The decision is made to dig up and burn those already buried, 107,000 corpses, to prevent fouling of ground water. Reduction of food rations for Jews in Germany. SS begins cashing in possessions and valuables of Jews from Auschwitz and Majdanek. German banknotes are sent to the Reichs Bank. Foreign currency, gold, jewels and other valuables are sent to SS Headquarters of the Economic Administration. Watches, clocks and pens are distributed to troops at the front. Clothing is distributed to German families. By February, 1943, over 800 boxcars of confiscated goods will have left Auschwitz. Himmler orders all Jews in concentration camps in Germany to be sent to Auschwitz and Majdanek. Mass killing of Jews from Mizocz Ghetto in the Ukraine. SS put down a revolt at Sachsenhausen by a group of Jews about to be sent to Auschwitz. Deportations of Jews from Norway to Auschwitz begin. The first transport from Theresienstadt arrives at Auschwitz. The mass killing of 170,000 Jews in the area of Bialystok. The first transport of Jews from Germany arrives at Auschwitz. Exterminations at Belzec cease after an estimated 600,000 Jews have been murdered. The camp is then dismantled, plowed over and planted. British Foreign Secretary Eden tells the British House of Commons the Nazis are “now carrying into effect Hitler’s oft-repeated intention to exterminate the Jewish people of Europe.” U.S. declares those crimes will be avenged. Sterilization experiments on women at Birkenau begin. The number of Jews killed by S.S. Einsatzgruppen passes one million. Nazis then use special units of slave laborers to dig up and burn the bodies to remove all traces. First resistance by Jews in the Warsaw Ghetto. Ernst Kaltenbrunner succeeds Heydrich as head of RSHA. The Romanian government proposes to the Allies the transfer of 70,000 Jews to Palestine, but receives no response from Britain or the U.S.
Greek Jews are ordered into ghettos. Germans surrender at Stalingrad in the first big defeat of Hitler’s armies. Jews working in Berlin armaments industry are sent to Auschwitz. The start of deportations of Jews from Greece to Auschwitz, lasting until August, totaling 49,900 persons. The Krakow Ghetto is liquidated. Bulgaria states opposition to deportation of its Jews. Newly built gas chamber/crematory II opens at Auschwitz. Newly built gas chamber/crematory V opens at Auschwitz. The Bermuda Conference occurs as representatives from the U.S. and Britain discuss the problem of refugees from Nazi-occupied countries, but results in inaction concerning the plight of the Jews. Waffen S.S. attacks Jewish Resistance in Warsaw Ghetto. S.S. Dr. Josef Mengele arrives at Auschwitz. German and Italian troops in North Africa surrender to Allies. Nazis declare Berlin to be Judenfrei (cleansed of Jews). Himmler orders liquidation of all Jewish ghettos in occupied Poland. Newly built gas chamber/crematory III opens at Auschwitz. With its completion, the four new crematories at Auschwitz have a daily capacity of 4,756 bodies. Two hundred Jews escape from Treblinka extermination camp during a revolt. Nazis then hunt them down one by one. Exterminations cease at Treblinka, after an estimated 870,000 deaths. The Vilna and Minsk Ghettos are liquidated. The Danish Underground helps transport 7,220 Danish Jews to safety in Sweden by sea. Himmler talks openly about the Final Solution at Posen. Massive escape from Sobibor as Jews and Soviet POWs break out, with 300 making it safely into nearby woods. Of those 300, fifty will survive. Exterminations then cease at Sobibor, after over 250,000 deaths. All traces of the death camp are then removed and trees are planted. Jews in Rome rounded up, with over 1,000 sent to Auschwitz. The Riga Ghetto is liquidated. The U.S. Congress holds hearings regarding the U.S. State Department’s inaction regarding European Jews, despite mounting reports of mass extermination. Auschwitz Kommandant Höss is promoted to chief inspector of concentration camps. The new kommandant, Liebehenschel, then divides up the vast Auschwitz complex of over 30 sub-camps into three main sections. The first transport of Jews from Vienna arrives at Auschwitz. The chief surgeon at Auschwitz reports that 106 castration operations have been performed. Soviet troops reach former Polish border. In response to political pressure to help Jews under Nazi control, Roosevelt creates the War Refugee Board. Nazis raid a French home for Jewish children. Two Jewish inmates escape from Auschwitz-Birkenau and make it safely to Czechoslovakia. One of them, Rudolf Vrba, submits a report to the Papal Nuncio in Slovakia which is forwarded to the Vatican, received there in mid June. First transports of Jews from Athens to Auschwitz, totaling 5,200 persons. Himmler’s agents secretly propose to the Western Allies to trade Jews for trucks, other commodities or money. Rudolf Höss returns to Auschwitz, ordered by Himmler to oversee the extermination of Hungarian Jews. Beginning of deportation of Jews from Hungary to Auschwitz. Jews from Hungary arrive at Auschwitz. Eichmann arrives to personally oversee and speed up the extermination process. By May 24, an estimated 100,000 have been gassed. Between May 16 and May 31, the SS report collecting 88 pounds of gold and white metal from the teeth of those gassed. By the end of June, 381,661 persons – half of the Jews in Hungary – arrive at Auschwitz. A Red Cross delegation visits Theresienstadt after the Nazis have carefully prepared the camp and the Jewish inmates, resulting in a favorable report. D-Day: Allied landings in Normandy. Rosenberg orders Hay Action; the kidnapping of 40,000 Polish children aged 10 to 14 for slave labor in the Reich. Auschwitz-Birkenau records its highest-ever daily number of persons gassed and burned at just over 9,000. Six huge pits are used to burn bodies, as the number exceeds the capacity of the crematories. Soviet troops liberate first concentration camp at Majdanek where over 360,000 had been murdered. The last Jewish ghetto in Poland, Lodz, is liquidated with 60,000 Jews sent to Auschwitz. A revolt by Sonderkommando (Jewish slave laborers) at Auschwitz-Birkenau results in complete destruction of Crematory IV. Nazis seize control of the Hungarian puppet government, then resume deporting Jews, which had temporarily ceased due to international political pressure to stop Jewish persecutions. The last transport of Jews to be gassed, 2,000 from Theresienstadt, arrives at Auschwitz. Nazis force 25,000 Jews to walk over 100 miles in rain and snow from Budapest to the Austrian border, followed by a second forced march of 50,000 persons, ending at Mauthausen. Oskar Schindler saves 1,200 Jews by moving them from Plaszow labor camp to his hometown of Brunnlitz. As the Allies advance, the Nazis conduct death marches of concentration camp inmates away from outlying areas. Soviets liberate Budapest, freeing over 80,000 Jews. Invasion of eastern Germany by Soviet troops. Liberation of Warsaw by the Soviets. Nazis evacuate 66,000 from Auschwitz. Soviet troops liberate Auschwitz. By this time, an estimated 2 million persons, including 1,500,000 Jews, have been murdered there. Ohrdruf camp is liberated, later visited by General Eisenhower. Berlin reached by Soviet troops. U.S. 7th Army liberates Dachau. Americans free 33,000 inmates from concentration camps. Theresienstadt taken over by the Red Cross. Unconditional German surrender signed by General Jodl at Reims. Hermann Göring captured by members of U.S. 7th Army. S.S. Reichsführer Himmler commits suicide. Opening of the Nuremberg International Military Tribunal. Former Auschwitz Kommandant Höss, posing as a farm worker, is arrested by the British. He testifies at Nuremberg, then is later tried in Warsaw, found guilty and hanged at Auschwitz, April 16, 1947, near Crematory I. “History will mark me as the greatest mass murderer of all time,” Höss writes while in prison, along with his memoirs about Auschwitz. Göring commits suicide two hours before the scheduled execution of the first group of major Nazi war criminals at Nuremberg. During his imprisonment, a (now repentant) Hans Frank states, “A thousand years will pass and the guilt of Germany will not be erased.” Frank and the others are hanged and the bodies are brought to Dachau and burned (the final use of the crematories there) with the ashes then scattered into a river. 23 former SS doctors and scientists go on trial before a U.S. Military Tribunal at Nuremberg. 16 are found guilty, with seven being hanged. 21 former S.S. Einsatz leaders go on trial before a U.S. Military Tribunal in Nuremberg. 14 are sentenced to death, with only four (the group commanders) actually being executed. The other death sentences are commuted.